IBM 1130 with peripherals, including paper tape reader punch, IBM 1442 card reader/punch (rear) and IBM 1627 Calcomp plotter. The IBM 1130 Computing System, introduced in 1965, was IBM's least expensive computer at that time. It was aimed at price-sensitive, computing-intensive technical markets like education and engineering, succeeding the IBM 1620 in that market segment. The 1130 was also used as an intelligent front-end for attaching an IBM 2250 Graphics Display Unit, or as remote job entry (RJE) workstation, connected to a System/360 mainframe. A double width SLT card from an IBM 1130. The square metal cans contain the hybrid circuits. The total production run of the 1130 has been estimated at 10,000. The 1130 holds a place in computing history because it (and its non-IBM clones) gave many people their first direct interaction with a computer. Its price-performance ratio was good and it notably included inexpensive, removable disk storage, with reliable, easy-to-use software that supported several high-level languages. The low price (from around $32,000 or $41,000 with disk drive) and well-balanced feature set enabled interactive "open shop" program development. The IBM 1130 used the same electronics packaging, called Solid Logic Technology (SLT), used in System/360. It had a 16-bit binary architecture, as did later minicomputers like the PDP-11 and Data General Nova. The address space was 15 bits, limiting the 1130 to 32,768 16-bit words (65,536 bytes) of memory. The 1130 used magnetic-core memory, which the processor addressed on word boundaries, using direct, indirect, and indexed addressing modes. IBM implemented five models of the 1131 Central Processing Unit, the primary processing component of the IBM 1130. The Model 1 through Model 5 described the core memory cycle time, as well as the model's ability to support disk storage. A letter A through D appended to the model number indicated the amount of core memory installed. The Model 4 was a lower-priced product with a 5.6 µs cycle time. Some purchasers of performance upgrades observed that the field adjustment to achieve the improvement was surprisingly trivial. The IBM 1132 printer relied on the 1130 processor rather than internal logic to determine when to fire the print wheels as they rotated. Printers for the Model 4 ran more slowly, but the slower processor still could not keep up with it. The hardware manual disclosed that when the Model 4 was servicing the two highest-level interrupts (the level 0 card-reader column interrupt or the level 1 printer interrupt), it ran at the faster 3.6 µs cycle time. Some users of the Model 4 would write a phony printer driver that did not dismiss the printer interrupt, in order to benefit from the higher processor speed. However, lower-level interrupts were disabled during this interval, even the end-of-card interrupt (level 4) from the 1442 card reader. The IBM 1800 was a variant of the IBM 1130 for process control applications. It used hardware rather than core memory for the three index registers and featured two extra instructions (CMP and DCM) plus extra interrupt and I/O capabilities. It was a successor to the IBM 1710, as the IBM 1130 was a successor to the IBM 1620. The IBM 1500 was a multi-user educational system based around either an IBM 1130 or an IBM 1800. It supported up to 32 student work stations each with a variety of audio-visual capabilities. February 11, 1965 - IBM introduces the 1130 (Models 1A, 1B, 2A, and 2B). Also announced is the IBM 1132 printer, the lowest cost online computer printer ever announced by IBM at that time. Fourth quarter 1965 - First customer shipments begin from the San Jose plant. March 31, 1966 - IBM introduces the IBM 1500 educational system. August 9, 1966 - IBM rolls out the 1130 synchronous communications adapter, which permits the small 1130 system to be connected by regular leased telephone lines to, and function as a communications terminal for, any model of the IBM System/360. An improved commercial programming package. January 1968 - First shipments begin of the 1130 Models 2C, 2D, 3B, 3C, and 3D. July 1968 - The Boca Raton plant begins shipping the 1130. July 22, 1971 - 1130 Models 4A and 4B are introduced at new levels of economy. September 1971 - First customer shipments begin of the 1130 Model 4. May 31, 1972 - Models 1C, 1D, 5B, 5C and 5D are announced. To maximize speed and conserve space, the operating system and compilers were written entirely in assembly language and employed techniques that are rare today, including intermixing code and data as well as self-modifying code. Much user programming was done in Fortran. The 1130 Fortran compiler could run on a machine with only 4,096 words of core—though the compiled program might not fit on such a machine. A compilation comprised many small "phases" that processed the entire source program and took it another step toward machine code. For example, the first phase read the source statements into memory, discarding comment lines, squeezing out all spaces (Fortran syntax is unusual in that no spaces are significant except in text literals), concatenating continuation lines and identifying labels, and performing no syntax checking beyond what might be discovered during this stage. The compiler was available in a disk-resident version as well as on 8-channel punched paper tape or punched cards. The most widely used operating system for the 1130 was the Disk Monitor System Version 2 (DM2) introduced in 1967. DM2 was a single-task batch-oriented system. It required a system with at least 4 KB of core memory and one integrated 2310 disk drive for system residence. The Supervisor was tiny by modern standards, containing assorted system details such as first-level interrupt routines, called Interrupt Level Subroutines, plus the disk driver and routines to load the interpreter of job control commands and the card reader driver. Device drivers for other I/O devices required by a job were incorporated as part of the loading of that job, which might also include the replacement of the basic disk driver by a more advanced driver. During the execution of a job, only a resident monitor, called the Skeleton Supervisor resided in memory. This Supervisor required just 1020 bytes, so a task's first available memory started with address /01FE (hexadecimal) or word 510. When the job ended or was aborted, the Supervisor loaded the Monitor Control Record Analyzer (MCRA) to read the job control for the next. While the job was running, the Supervisor was inactive. Aside from device drivers and interrupt processing all CPU time was entirely devoted to the job's activities. Other programs distributed as part of the operating system were a core dump utility, DUMP, and the Disk Utility Program, DUP. A Card/Paper Tape Programming System was available to support systems without disk. There was a hierarchy of device drivers: those ending in Z were for Fortran, such as DISKZ, while assembler programmers might use DISK0, and DISK1 was even faster at reading multiple disk sectors. But DISKZ started its sector addressing with the first available unused sector, while the others started with sector zero of the disk, making it easy for a Fortran programmer dabbling in assembler to inadvertently overwrite the bootstrap loader. Other programming languages available on the 1130 included APL, BASIC, COBOL, FORTH, PL/I (in the form of the SL/1 interpreter), and RPG. There was even an Algol compiler, written in French, so that "Debut ...Fin;" took the place of "Begin ... End;". All its messages were in French, so "Bonne compilation" was the goal. Eastern Michigan University developed a Fortran IV compiler for the 1130, known as Fortran-EMU as an alternative to the Fortran IV (subset) compiler provided by IBM. It added many features, including the LOGICAL data type, enhanced diagnostics, and six-letter variable names. The Fortran-EMU compiler was distributed as a deck of punched cards in a disk image file format with all the remaining system area deleted, to prevent copying other modules that would normally reside on the same disk, such as the assembler or compilers. Oklahoma State University developed an ALGOL 68 compiler, written in ANSI Fortran 1966. IBM also distributed a large library of programs, both IBM-supported (Type I and II) and unsupported (Type III and IV). Punched card containing a self-loading 1130 program that would copy the deck of cards placed after it in the input hopper. The enduring memories of the IBM 1130 may have resulted from its need for continual human intervention. It was usually occupied running "jobs" specified by a deck of punched cards. The human operator would load jobs into the card reader and separate them back into jobs for return, perhaps along with printed output, to the submitter. The operator would also have to watch the 1130 for evidence of a malfunctioning or stalled job and intervene by pressing the INT REQ key on the keyboard to skip ahead to the start of the next job. Marking the start of a job was a punched card that started with // JOB. Any card that started with // was a command to the Supervisor and could not be used as user program or data. Other commands included // DUP to execute the Disk Utility Program (to delete files or add the file in the temporary area to the file collection) and // XEQ to execute a named program from disk. If a user program tried to read a command card, the standard card reader routine would signal end-of-input to the program and save that card's content for the Supervisor. When the IBM 1130 was started, the Supervisor would still be in memory and probably intact, as core memory retains its state without power. However, it was usual to begin by booting. The bootstrap procedure read one card from the card reader. The boot card contained binary code to read the contents of sector zero of the disk drive, which in turn would handle the "operation complete" interrupt from the disk drive and perform additional disk reads to prepare the 1130 for the first punched-card job. The whole process took about a second to complete. If the operator concluded that a user program had stalled, the Supervisor could sense a key press to abort the program and skip ahead to the next // card. The Supervisor was not protected against modification by a badly written job, a case that might require that the operator reboot the 1130. Nor was there protection against writing to disk. If the copy of the system software on disk were modified, it could be restored by reloading it from about 4000 binary-coded punched cards. The IBM 2310 disk drive stored sectors of 320 words (640 bytes) plus a one-word sector address. 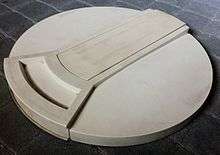 A cylinder consisted of two tracks on the top and bottom surfaces of the 2315, or of one platter on the 1316 disk pack used in the 2311. Each disk cylinder contained eight sectors. A sector was logically divided by the monitor into sixteen disk blocks of 20 words each (40 B); the disk block was the unit of allocation for files. The system distinguished between system cartridges, which contained the monitor and utilities along with user data, and nonsystem cartridges, which contained user data only. A system cartridge contained the cartridge id and the cold-start program (bootstrap code) in sector 0 followed by a communications area and the resident monitor in sectors one and two. Sectors three through five contained the System Location Equivalence Table (SLET)—a directory of all phases of all monitor programs. Other control information filled out the first track. The system area was followed by a fixed area containing system utilities, disk driver subroutines, IBM-supplied compilers and other control information. This area was mapped by a Fixed Location Equivalence Table (FLET) containing the file format, file name, and disk block count. The fixed area also contained the Location Equivalence Table (LET), in the same format as the FLET, mapping the following user area of the disk. The LET and FLET consisted of one entry per file on the disk giving the file's name and format information, its size in disk blocks, and its starting block number. All disk files were contiguous disk blocks, thus there was no fragmentation. A program in need of working storage could use and modify named files, but could not expand them beyond their created size. Free space started after the last named file, and might be partially occupied by a temporary file, as the assembler or a compiler might produce. If a file was to be modified, the usual process was to use // DUP commands to delete it, which would move any subsequent files back to close the gap, and then rename the temporary file as the new version of the file. Rarely modified files would thus sink towards the start of the disk as new files or new versions were appended, and frequently modified files would jostle amongst each other towards the end of the disk. Disk space was at a premium, so program source files were normally kept as decks of cards. Users having larger requirements would arrange to have a disk of their own containing the operating system but only their files and would have to replace the "pool" system disk with theirs and restart the system when their turn at being operator came. A system with a second disk drive that could be devoted entirely to some user's code and data provided a great sense of spaciousness. Disk memory was used to store the operating system, object code, and data, but source code was kept on punched cards. The basic 1130 came with an IBM 2310 voice-coil actuated disk drive, called "Ramkit", from IBM's General Products Division in San Jose. :497 These read pizza-box-sized IBM 2315 single platter cartridges that held 512,000 words or 1,024,000 bytes (less than a 3.5" HD floppy's 1.44Mb or even the 5.25" HD floppy's 1.2Mb). The console typewriter used an IBM Selectric mechanism, which meant one could change the type by replacing a hollow, golf-ball sized type element. There was a special type element available for APL, a powerful array-oriented programming language using a special symbolic notation. A row of 16 toggle switches on the console typewriter could be individually tested from within programs, using the special Fortran statement IF (SENSE SWITCH i), for example. Magnetic tape - From 1968, IBM 2415 Magnetic tape data storage drives were available as an RPQ. Graphics - IBM 2250 Graphic Display Unit. Color Pen Plotter - IBM 1627 drum plotter. Communications - Synchronous Communications Adapter (SCA). The IBM 1130 MTCA, for Multiple Terminal Control Adapter, announced in 1970 allowed up to four 2741 terminals to be connected to an IBM 1130, for use with APL. To simplify the design of peripheral devices, these relied on the processor. The card reader had no memory buffers, but instead gave the CPU a level-zero (highest priority) interrupt after each individual column of the card had been read. If the CPU did not respond and store the twelve bits of data before another such interrupt indicated that the next column had been read, data would be lost. Similarly, the 1132 printer relied on software on the 1130. When a letter such as A came into position, the CPU had to analyze a buffered line of text and assemble an array of bits that would indicate to the 1132 which print positions should be printed with A. If the CPU could not respond before the A rotated out of position, print speed would be severely degraded. Other peripherals accepted text in a device-specific code convenient for its hardware. The CPU had to translate it to or from the EBCDIC code in which the CPU processed the text. Instructions had short (one-word) and long (two-word) formats. Most computational, load, and store instructions referenced one register (usually ACC) and a memory location. The memory location was identified, in the short format, by an 8-bit signed displacement from either the current address or one of the index registers; or in the long format, by a full 15-bit address, which could be indexed and specify indirection. Memory was addressed in units of words. The 1130 supported only single-precision and double-precision binary data natively (16 and 32 bits) stored in big-endian format. Standard- and extended-precision floating-point (32 and 48 bits) and decimal data were supported through the use of subroutines. Most conditional transfers were based on condition indicators as set by a preceding operation, usually reflecting the contents of ACC. Transfers could be by skip (which assumed that the next instruction was short) or by branch. Implemented as memory words 1,2,3, not as hardware registers. /0000 By convention, contained the instruction B *-1, which would branch to itself indefinitely until an operator noticed that all the console IAR lights were dark and flushed the job, either by pressing Int Req or by rebooting. /0008 The address of the handler for the Level 0 (highest priority) interrupt— 1442 card reader/punch "column ready" interrupt. /0009 The address of the handler for the Level 1 interrupt— 1132 printer and Synchronous Communications Adapter. Handlers for this and lower interrupts would have to test a Status Word to determine which device had interrupted. /000A=10 The address of the handler for the Level 2 interrupt— disk storage, Storage Access Channel. /000B=11 The address of the handler for the Level 3 interrupt— 1627 plotter, Storage Access Channel. /000C=12 The address of the handler for the Level 4 interrupt— 1134 paper tape reader, 1055 paper tape punch, console, 1442 card read punch, 2501 card reader, 1403 printer, 1231 optical mark reader, Storage Access Channel device. /000D=13 The address of the handler for the Level 5 (lowest priority) interrupt— console stop and interrupt switches, Storage Access Channel. /0020=32 First word of the scan field for the 1132 printer (/0020–/0027). /0026=38 Last full word of the scan field. /0027=39 Half used: 120 columns = 120 bits = seven 16-bit words plus 8 bits. This section uses the Fortran convention that subprograms comprise subroutines (which stand alone in the Fortran CALL statement) and functions (which can be combined in arithmetic expressions and always return result values). The 1130 had no hardware support for a stack. Most subprograms were called with the instruction BSI (Branch and Store IAR). This deposited the value of IAR (the return address) at the destination address and transferred control to destination+1. Subprograms returned to wherever they were called on that occasion using an indirect branch through that first word of the subprogram. Placing the return address in-line was a common technique of computers at that time, such as the Hewlett-Packard HP 2100 and the Scientific Data Systems SDS 920. SIMPL: DC     *-*    This is the entry point, filled with a zero initially. B    I SIMPL  Return by an Indirect branch, to the address found in location SIMPL. END    SIMPL  Instructs the assembler that the source for routine SIMPLE is complete. BSI  L SIMPL  Call SIMPL. L (Long) is needed if SIMPL is more than -128 or +127 words away. The pseudo-operation CALL would typically be used. When SIMPL is called, the BSI instruction replaces *-* with the current value of IAR, which is the address just past the BSI instruction. After SIMPL does whatever it is written to do, B I SIMPL branches not to SIMPL, but indirect through it, thus continuing execution with the instruction following the BSI instruction that called SIMPL. Without extra arrangements to protect the return address, recursion would be impossible: If SIMPL called itself, or called a subprogram that called it, its original return address would be overwritten. Re-entrancy was problematic for the same reason: An interrupt service routine must refrain from calling any subprogram that might have been the code that was interrupted. The caller of SIMPL might pass it parameters, which might be values or addresses of values. Parameters might be coded in-line (immediately following the BSI instruction) or might be placed in index registers XR1 and XR2. If parameters were placed in-line, SIMPL would modify its own return address so its final indirect branch returned beyond the parameters. Integer functions of a single integer would expect the parameter in the accumulator and would return their result there. Floating-point functions employed the floating-point accumulator (a two word area set aside by the floating-point library, three words for extended precision), and so on. The convention of coding 0 as the initial value at the entry point meant that if a programming error led to SIMPL returning before the first time it was ever called, execution would jump to memory location 0. As mentioned above, it was customary to have location 0 contain a branch to location 0. The 1130 would be stuck at location 0, and the IAR lights on the console would be entirely dark, making it clear the program had failed. For subprograms that would be called many times (for example, subprograms for floating-point arithmetic), it was important to reduce the size of each call to one word. Such "library routines" used the LIBF protocol. It was more complex than the CALL protocol described in the previous section, but LIBF hid the complexity from the writer of the assembly-language program. Library routines were addressed through index register XR3. (Fortran programs would use index register XR1 for the addresses of parameters and the return address, but register XR2 was unused.) XR3 would be pointed to a sequence of three-word transfer vectors such that the first entry would be -128 words from XR3's value. The programmer would call the library routine using the LIBF pseudo-operation, which assembled not a direct BSI to the routine but a one-word indexed branch instruction (BSI 3 disp) whose displacement (-128, -125, and so on) identified the start of the routine's transfer vector. DC       *-*            A word into which BSI stores the return address. B    L   SIMPL          Branch to the start of the library function. SIMPL STX   1  RCVR1+1        Save the caller's value of XR1 at a nearby location. LDX  I1  *-*            The linkage loader changes the address word to point to the transfer vector. STX   1  RETN+1         Store XR1 to prepare to use it as a return address. *                              restore the original value of XR1. RETN  B    L   *-*            This instruction was modified two instructions ago; return. Suppose a LIBF-style call to SIMPL were at address 100. Then the return address would be 101, because BSI 3 disp is a one-word instruction. XR3 will point into the group of transfer vectors. If the transfer vector for SIMPL started at address 2000, then the BSI would be assembled with a disp so that XR3+disp = 2000. Executing the BSI stores 101 at location 2000 and jumps to location 2001. At 2001 would be a two-word long jump to the entry point of SIMPL, which the linkage loader might have placed at address 300. The long jump transfers control to SIMPL. After the instruction at 300 stores XR1, the instruction at 301 is LDX I1 2000, the linkage loader having placed 2000 at location 302. This does not load 2000 into XR1; it is an indirect instruction, and loads the contents of 2000, which is 101, the return address for that call to SIMPL. If SIMPL took parameters coded in-line following the BSI instruction, SIMPL could gain access to them with indexed addressing off XR1. The first could be obtained by LD 1 0, the second by LD 1 1, and so on. If the second parameter was the address of the actual parameter, then LD I1 1 would obtain its value. Before returning, SIMPL would increment XR1 past the n parameters with an instruction such as MDX 1 n so as to place the right value at RETN+1. A LIBF routine that declined to restore the original value of XR1 could omit the above steps and return with a simple B 1 n to skip n in-line parameters. However, such a routine could not be called by other LIBF routines because it would disrupt the caller's use of XR1 for access to its own parameters and return address. The complexity of LIBF saves memory for subprograms that are frequently called. ::p.24 The LIBF linkage requires one word per invocation, plus three words for the transfer vector entry and extra code in the routine itself, whereas the CALL linkage requires two words per invocation because most CALLs will be to an address beyond the -128 to +127 word reach of the one-word opcode. The register XR3 must point to the transfer vector entries for the library routines rather than a dispatch table of only their addresses, because this latter would require that LIBF routines be called with an indirect BSI instruction. These instructions are two words long, so such a design would negate the code size savings of LIBF. The eight-bit limit for the disp field of the one-word instruction code limits usage of LIBF routines to no more than 85 distinct entries. The previous sections show that code and data were intermingled. It was common to modify the address fields of instructions and, in fact, to modify entire instructions. The Fortran compiler produced self-modifying code when generating code for any subprogram that had parameters. The compiler built a table of every location where the subprogram referenced one of its parameters, and compiled as the first instruction in the body of the subprogram a call to a subprogram called SUBIN that used the table to modify the address field of every reference to a parameter to be the actual address of the parameter during the current invocation. SUBIN made these patches every time the subprogram was called. To obtain the operand's address an indirect indexed instruction required three memory cycles (the index register being in memory) while the direct access instruction required only one. If SIMPL were to pass one of its parameters to any subprogram that expected to receive the address of its parameter (including all the LIBF routines for floating-point arithmetic), SUBIN was needed to supply the actual address of the original parameter. The disadvantages of SUBIN were the time it required to run and the memory required for the table of references. The size of this table was the sum of 5, the number of parameters, and the number of references; if this sum exceeded 511, compilation would fail. For subprograms with many references to a parameter, the author of the subprogram might copy the parameter into a local variable. BSI  L IOR    Two-word jump to the start of the IOR function. DC     I      A one-word in-line parameter: The address of I.
DC     J      A one-word in-line parameter: The address of J. After performing that transformation, it did not return past the end of the four-word block (which it had just modified). Instead, it branched to the exact address from which it had been called originally. The BSI instruction was no longer there; what was now there was the two instructions it had just written. They combined the two integers with the machine-language OR instruction and left the result in the accumulator, as required. The call to IOR and the transformation of the four-word block happened at most once per program run. If the Fortran line illustrated above were executed again, it would run faster than it did the first time. Similar functions could be devised for other useful operations. A function that self-modified, as IOR does, could not be used in a Fortran subprogram on any of the parameters to that subprogram (though it could be used to combine local variables) because it is incompatible with the SUBIN subprogram discussed above. IOR's transformation of its four-word calling sequence, shown above, moves the location of the address of variable I. On subsequent calls to the Fortran subprogram, the table of references to parameters would be in error and SUBIN would patch the wrong word, in this case placing the new address of I over the OR operation code. Data to be manipulated and the instructions that manipulated them had to reside together in core memory. The amount of installed memory (from 4,096 to 32,768 words) was a key limitation. 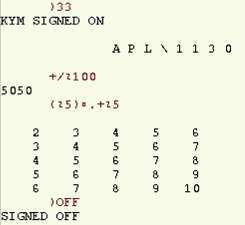 Fortran provided several techniques to write large programs despite this limitation. Fortran let any subprogram be designated as "LOCAL" (Load-on-Call). Each LOCAL subprogram was an overlay; it would be part of the disk-resident executable program but would only be loaded into core memory (if not already there) during the time it was called. So, for example, six LOCAL subprograms would require only as much core memory as the largest, rather than the total amount for all six. However, none of the six could invoke another, either directly or through intermediary subprograms. An entire Fortran program could pass control to a subsequent phase, exiting to the Supervisor with an instruction to load the follow-on phase into core memory. A large program might be split into three parts, separately compiled, called PART1, PART2, and PART3. Execution would be started by // XEQ PART1 and at a suitable point, PART1 would execute the Fortran statement CALL LINK(PART2) and so forth. The name of the successor program in the CALL could not be variable, but program logic could govern whether control was transferred to another phase, and which CALL LINK statement was executed. It was mentioned above that the Fortran compiler itself was written this way, with each phase of compilation achieved by a separate program. Programs, such as Fortran programs, resided at low core memory addresses (just above the Supervisor). Fortran allocated space at the highest addresses for any variables and arrays declared COMMON. If a follow-on phase of the program contained a corresponding COMMON declaration, then information in this common area could be shared among phases. Phases could omit the COMMON declaration without problem, provided those phases were not so large as to have their program code invade the common area. COMMON storage not only shared data between phases; lower-memory COMMON variables could be used to pass data among a main program and subprograms within a single phase, though the data could be lost on moving to the next phase. The examples can be executed on the IBM 1130 emulator available at IBM 1130.org. The following listing shows a card deck that compiles and runs an Assembler program that lists a deck of cards to the line printer. In this job, the assembler leaves the result of its assembly in the temporary area of the system disk, and the XEQ command executes the content of the temporary area. The odd-looking END START has two meanings: end of assembler source, and the name of the entry point of the routine, which has the label START. Assembler source starts with column 21 of the card, not column one. In systems without a disk drive, the assembler would punch code into the start of the card just read (the card reader was actually a reader-punch, with the punch station after the read station) and then read the next card. To handle forward branches and the like, the assembler's second pass literally involved a second pass of the cards through the reader/punch. If source changes were needed the programmer would duplicate the cards to obtain a deck with columns 1-20 blank ready for the next run through the assembler. By convention, buffers are preceded by a word count. The DC assembles a count word and the following BSS reserves the required number of words for the buffer. The card buffer requires 80 words, one for each card column. Driver CARD0 reads each card column literally, using 12 of the 16 bits in the buffer word to describe whether there is a punch in the corresponding row for that column. The pattern of punches typically describes a text character using the Hollerith code. The console keyboard also gives input to the program in the Hollerith code, the only case of two devices using the same character encoding. The printer routine, however, works with text in 8-bit EBCDIC with two characters per word, requiring a 40-word buffer. The program uses library routine ZIPCO to perform the conversion. The CALL HLEBC is not executed because HLEBC is not a subroutine but an IBM-supplied Hollerith-to-EBCDIC conversion table. The CALL statement provides the address of the table to ZIPCO and ensures that the linking loader includes the table in the program, thus it is the fifth parameter to ZIPCO. After the conversion, the program sends the converted output, now in buffer PBUFF, to the printer through driver PRNT1. Again, the program loops until the printer driver reports completion, then the program reads the next card. This example contains no code to decide when to stop. A more complete program would check for cards that begin with //, which denotes the start of the next job. To stop the card reader as soon as possible, a program could check for the Hollerith code of / before even converting the card to EBCDIC. The call to CARD0 to read a card initiates that operation and immediately returns to the caller, which could proceed with other activity. However, the example program makes no attempt to overlap input and output using buffers; it simply loops back to CIMP to test afresh. After CARD0 has sensed the card reader's operation-complete interrupt, it returns one word further on, thus skipping the jump back to CIMP and leaving the loop. The example routines do not run the I/O devices at top speed. Notably, the card reader, only a few milliseconds after reporting completion on reading a card, will commence its stop sequence, after which a new read command will have to wait to initiate another read cycle. The IBM 1442 reader could read 400 cards/minute at full speed, but just a little hesitancy in the read commands would halve its throughput or worse. A Fortran program could not complete even the simplest input processing in time, and so could not read cards at full speed. One common Fortran DO loop to read cards made the motor stop and start so frequently as to accelerate wear. With buffering, the card reader control could be overlapped with processing, and the reader could be run at full speed through large data decks, but memory for the more complex program and for buffers was often at a premium. Even with assembler and double buffering, a program to list a deck of cards from the IBM 2501 reader (1,000 cards/minute) on the line printer could not keep up, as the translation from card hole patterns to EBCDIC for the printer as done by EBPRT was too slow; the more complex ZIPCO and HLEBC were needed instead, as in the example. The following listing shows a card deck that compiles and runs a Fortran program and Fortran subroutine for the IBM 1130 when running DM2. The above session shows a signon, addition of the integers 1 to 100, generation of an addition table for the integers 1..5 and a sign off. Brian Utley was the 1130s Project Manager during its development and introduction. Brian said at the third 11/30 party that before IBM Marketing named the 1130 it was known as the Small Engineering Computer System or SECS. The initial architecture was 18 bits but was changed to 16 bits due to the influence of the System/360 development. The full dialogue of his 2005 presentation is available at IBM1130.org. LISP guru Guy Steele wrote a LISP interpreter for the IBM 1130 when he was in high school (Boston Latin School, which had an IBM 1130 for student use). His code and documentation for LISP 1.6, along with a summary of current work in getting it to run under simulation, is available at IBM1130.org. Chuck Moore wanted to call his new language "Fourth" but the IBM 1130 operating system was limited to five-character names, so it wound up being called FORTH. Dan Bricklin, creator of the VisiCalc program, got his start in programming when he learned and used the IBM 1130 as part of the National Science Foundation Computer/Math Summer Project for high school students, given at the University of Pennsylvania in 1966. An IBM 1130 with 8 kilowords of core was used for the world's first full-time Search for Extraterrestrial Intelligence research at The Ohio State University Radio Observatory. The system was an IBM 1130 computer, a machine the size of a desk with 8KB of main memory, a 512KB disk drive, a Teletype CX paper tape reader and BRPE paper tape punch, and a Photon 713 photomechanical typesetter. The assignment was my first experience with managing a machine-readable document database: I learned to roll the punched paper tape carefully so that it could be stored neatly in cylindrical waste paper baskets. In the meantime, though I didn't know about it, the roots of generalized markup were being planted. Historically, electronic manuscripts contained control codes or macros that caused the document to be formatted in a particular way ("specific coding"). In contrast, generic coding, which began in the late 1960s, uses descriptive tags (for example, "heading", rather than "format-17"). Alan Kay used the IBM 1130 in early GUI work for his Ph.D. thesis in 1969. Hutchinson Central Technical High School ("Hutch Tech") in Buffalo, NY used the IBM 1130 in the nation's first four-year high school computer science curriculum in 1969. Robert Santuci was the computer science program head and taught classes in programming and inductive logic. An engineer from IBM was hired by Signetics and incorporated a number of architectural features from the IBM 1130 into the Signetics 2650 single-chip processor. The Computer History Museum (Mountain View, California) has an IBM 1130 system. The National Museum of Computing (TNMOC) (Bletchley Park, United Kingdom) has a complete 1130 system. The University of Stuttgart (Germany) has a functional 1130 system. Carl Claunch is currently restoring an 1130 system. That, since the 1130 was a small scientific machine, the number was chosen by multiplying 360 (as in IBM 360) by π. That 11:30 was the time of day that product planners reached an impasse regarding what to call the product. That the 1130 was IBM's 11th Computer Design, and it had 30 instructions. 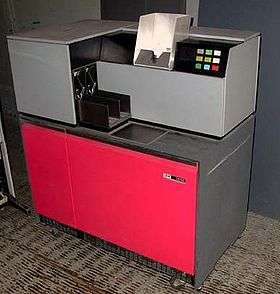 Others have speculated that the existence of the IBM 1130 explains why no computer designated "11/30" ever appeared in the PDP-11 family of machines. ↑ Utley, Brian (Jan 2005). "Guest speaker: Brian Utley" (MP3) (Interview). Retrieved 2012-01-02. ↑ "Press release:IBM introduces powerful small computer". International Business Machies. 11 February 1965. Retrieved 18 October 2012. 1 2 Emerson W. Pugh; Lyle R. Johnson; John H. Palmer (1991). IBM's 360 and early 370 systems. MIT Press. ISBN 9780262161237. ↑ Larry Breed (August 2006). "How We Got To APL\1130". Vector (British APL Association). 22 (3). ISSN 0955-1433. ↑ Hedrick, G.E. ; Robertson, Alan, "The Oklahoma State ALGOL 68 Subset Compiler". 1975 International Conference on ALGOL 68. Stillwater, OK, June 10–12, 1975. ↑ IBM Corporation (1967). 1130 Statistical System (1130-CA-06X) User's Manual (PDF). Retrieved Feb 8, 2015. ↑ IBM Corporation (1968). IBM 1130 Remote Job Entry Work Station Program Program Logic Manual (PDF). Retrieved Feb 8, 2015. ↑ IBM Corporation (1967). IBM 1130 Typesetting System (RPQ) (PDF). Retrieved Feb 8, 2015. 1 2 IBM Corporation (May 1972). IBM 1130 Disk Monitor System, Version 2, Programmer's and Operator's Guide (PDF). Retrieved Feb 6, 2015. ↑ IBM 1130 Custom Feature Description - Attachment Channel RPQ Number 831552, Form A26-1579-0 (PDF). IBM System Reference Library (First ed.). San Jose, California: IBM Corporation. October 1968. Retrieved 2009-08-10. ↑ IBM Corporation. "IBM Archives: DPD Chronology (page 4)". Retrieved 10 Aug 2011. ↑ Hewlett-Packard (December 1971). 2100A Computer Reference Manual (PDF). p. 18. Retrieved August 5, 2016. ↑ Scirntific Data Systems. 920 Computer Reference Manual (PDF). p. 17. Retrieved August 5, 2016. ↑ IBM Corporation (1968). IBM 1130 Assembler Language (PDF). Retrieved Feb 6, 2015. ↑ Utley, Brian (2006-10-30). "Origin of the IBM 1130 Name". Retrieved 2007-01-16. ↑ Booch, Grady (2003-04-03). "Grady Booch polishes his crystal ball". IBM. Retrieved 2007-01-16. ↑ Steele, Guy L., Jr. (2005-11-24). "Thoughts on Language Design -- New challenges require new solutions". Dr. Dobb's Journal. Retrieved 2006-01-16. ↑ Steele, Guy L., Jr. "Confessions of a Happy Hacker". Archived from the original on 2006-01-10. Retrieved 2006-01-16. ↑ Rather, Elizabeth; Colburn, Donald; Moore, Charles (March 1993). "The Evolution of Forth". Retrieved 2007-01-16. ↑ Bricklin, Dan (2002-08-23). "Memories while visiting the Bay Area and the Computer History Museum". Retrieved 2007-01-16. ↑ Dixon, Bob (2005-08-13). "SETI in the 1970s". The Big Ear. Retrieved 2007-01-16. ↑ Goldfarb, Charles (1996). "The Roots of SGML -- A Personal Recollection". Retrieved 2007-01-16. ↑ Kay, Alan C., "The Reactive Engine", Ph.D. dissertation, University of Utah, 1969. "The graphics display routines, character generator and editor ran for a year on an IBM 1130 computer with a “home-brew” interface. Unfortunately, the 1130 was straining to just act as a glorified display buffer, and none of the algorithmic routines were implemented." ↑ Koch, Warren (1972). "The Use of Computers in Instruction in Secondary Schools" (PDF). Retrieved 2014-08-06. ↑ "Signetics 2650: An IBM on a Chip". CPU Shack. 16 October 2016. Retrieved 25 October 2016. ↑ "IBM 1130". ACONIT. Retrieved July 11, 2016. ↑ "Artifact Details:BM 1130 model". Computer History Museum. Retrieved July 11, 2016. ↑ Wyss, Oscar. "Website von Oscar E. Wyss". COSECANS. Retrieved July 11, 2016. ↑ "IBM 1130 system restoration during 2011". The National Museum of Computing. Retrieved July 11, 2016. ↑ "IBM 1130". Computermuseum der Fakultät Informatik. Retrieved July 11, 2016. ↑ Claunch, Carl. "Rescue 1130". Retrieved July 11, 2016. 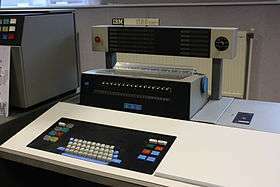 Wikimedia Commons has media related to IBM 1130. IBM Archive: IBM 1130 press releases, chronology, photos, facts folder. IBM 1130.org Norm Aleks and Brian Knittel site which has significant information about the 1130 and a downloadable simulator that supports the DMS R2V12 and APL environments. www.ibm1130.net is Howard Shubs' site dedicated to the 1130. IBM 1130 material at Columbia University, Computing History site.